I have another Earth Box update for you! We harvested our lettuce and carrots yesterday and I wanted to let you know how things came out. Lettuce is PERFECT for growing in the Earth Box. 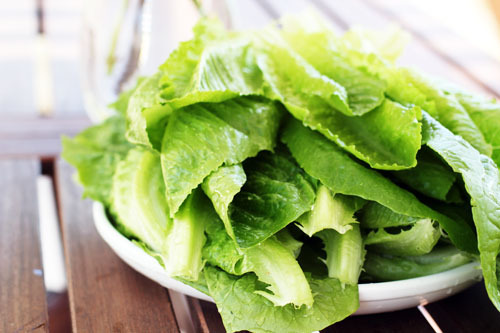 The heads of romaine lettuce grew beautifully, were very healthy and easy to take care of as they grew. I would recommend planting 8 lettuces in each Earth Box, but staggering the plantings a week or two apart (maybe 2 planted each week for a month). 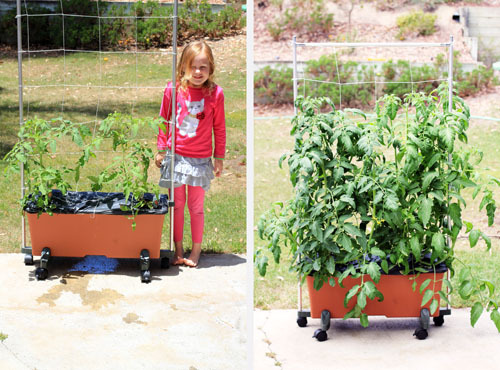 By staggering the planting, you will be able to harvest the lettuce over time instead of all at once. That’s what we’re going to do next year! Carrots are NOT perfect for growing in the Earth Box. Despite having at least a foot of depth for the carrots to grow, the carrots only grew a few inches long, if that! We think the roots must have sensors that report back to the carrot telling it to find somewhere else to grow. If this is the case, those sensors did a fantastic job. One of the carrots just kept twisting in on itself. You also can’t grow that many carrots in the Earth Box, so there isn’t much of a yield (16 total IF they all survive, and that’s if you just plant carrots in the box). 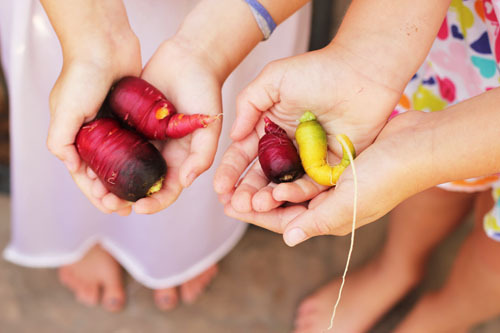 All in all carrots were not worth the effort, at least when grown in the Earth Box. The tomato plants are still going strong. They are fruiting and we are just waiting for the first ripe ones to appear! Quick update on our new Earth Boxes. 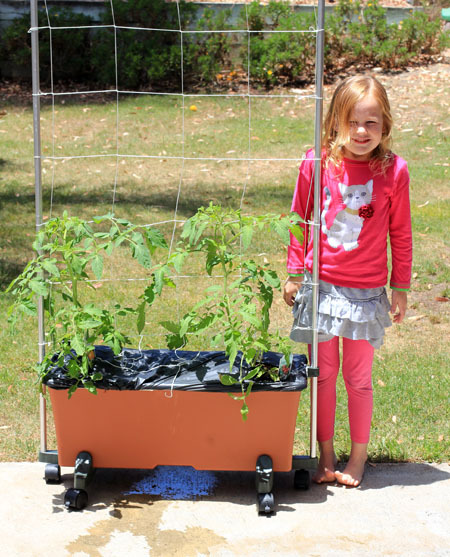 It’s been just two and a half weeks since I posted the photo with Anna below and look at how the tomato plants have grown! We just might have a tomato harvest his year and I am so happy! The other Earth Box I bought has carrots and lettuce planted and they are growing beautifully, too. It’s our last week of school and I am so excited for summer! Granted, we have a crazy busy summer ahead of us, but at least we can let the kids sleep in in the morning and I don’t have to pack lunches! – Pizza night to celebrate the last day of school! You know the drill! Please share your weekly menu so we can inspire one another! About every other year I decide I really want to grow tomatoes. And every other year I enthusiastically post a photo of our beautiful little tomato plants. And every other year I report back at the end of the summer that I killed everything. I am cursed. This year is going to be different. I know I’ve said that before, but really, it is! I bit the bullet and invested in two Earth Boxes. My friend Natalee has used them the last few years and has amazing success. 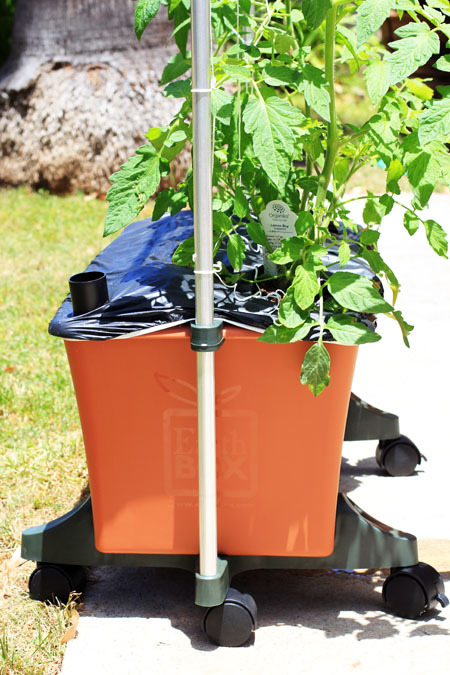 The beauty of the Earth Box is that you cannot overwater the plants – they always have just the right amount of water. You can use the boxes forever and you get about 8 growing seasons before you need to replace the soil. The woman at the garden center said she also loves the Earth Box. I really really really think this year is going to be different, folks. What’s that? Locusts in my backyard destroying my tomato plants? Figures.